Dormont W75BP2Q60 Hi-PSI Coated Water Connector Hose with 2-Way Quick Disconnect - 60" x 3/4"
The Dormont W75BP2Q60 Hi-PSI 60" x 3/4" coated water connector hose with 2-way quick disconnect is the smart, durable, and reliable way to hook up all of your water-using equipment! It's rated up to 225 degrees Fahrenheit, perfect for hot or cold applications, and can handle up to 150 PSI of pressure, making this one of the strongest hoses available. This Dormont water hose comes with a solid brass 2-way quick disconnect coupling to allow for fast and easy setup when attaching an appliance to the water supply. Simply pull back on the coupling's ring when not in use and it smoothly and immediately releases from the connection. Each hose is made of woven corrugated stainless steel to stand up to the harshest conditions. An antimicrobial PVC coating fights off mildew and mold for an added layer of protection, ensuring that this hose will be useable for years to come. 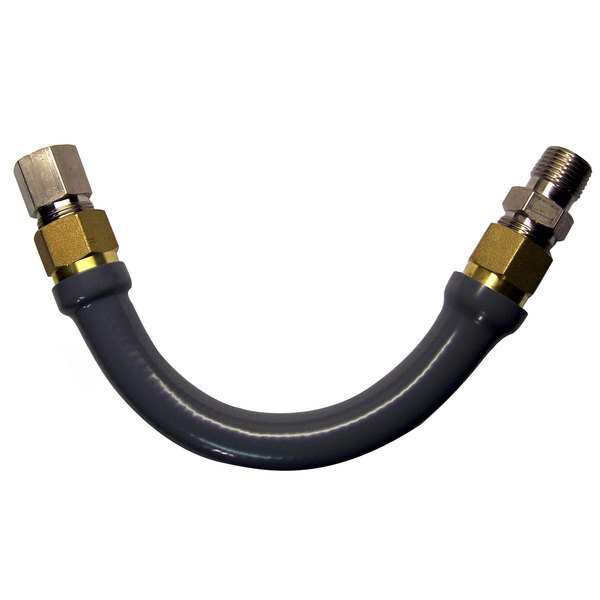 This hose is ideal for a wide variety of applications, including beverage equipment, steamers, combi-ovens, dishwashers, and other foodservice equipment.